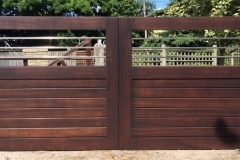 Staining/ Painting Gates or letting them go Silver Grey. 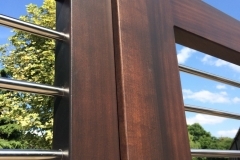 The question of which finish to have on your wooden gates, paint, stain or oil is one I get asked every day. 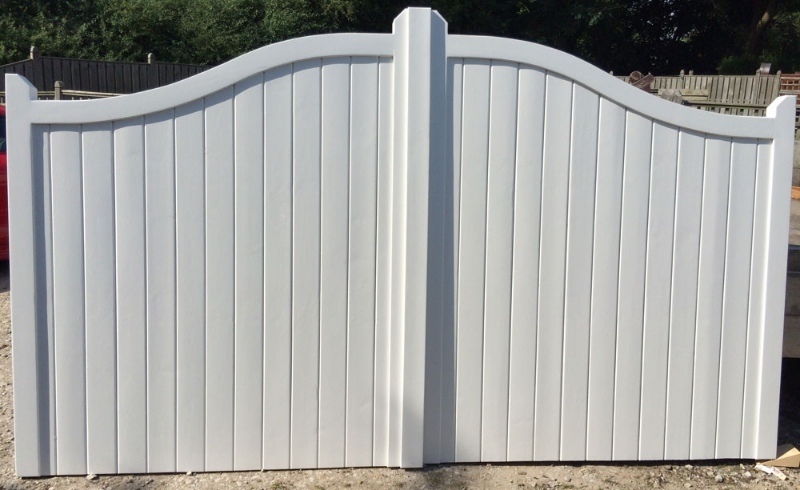 At Mitech we have a finishing spray shop where our hand made gates can get their complete finish applied. 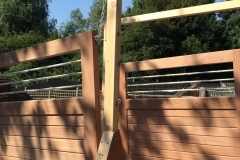 In our experience of studying how timber gates perform outside we can conclude that painting on Accoya wood is one of the most affective results that you can hope to achieve on a product that has been classified as one of the most un-dimentionally stable joinery products to produce. 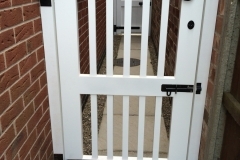 Don’t expect the same results on any gate that you may have achieved on your doors or windows around your home. 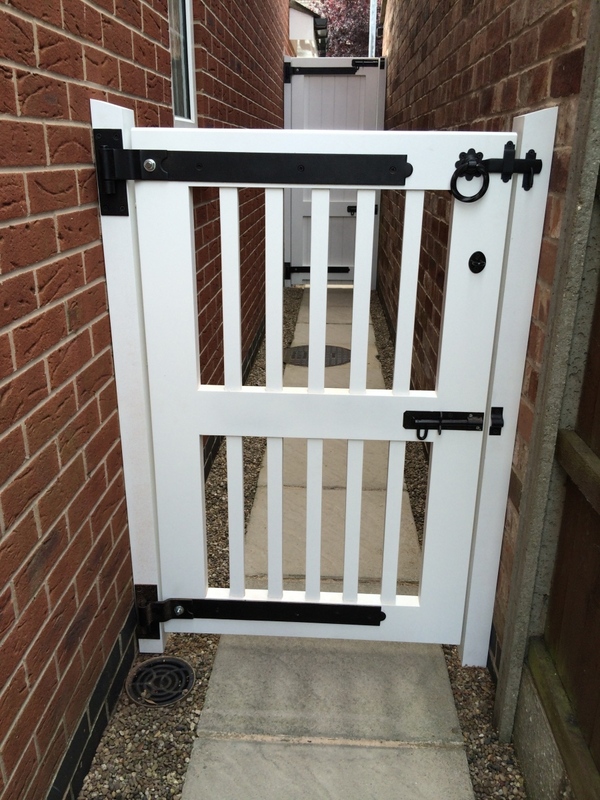 As gates are far more vulnerable to the elements. 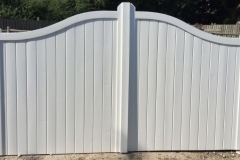 The beauty of painting your gates is that we can SEMI COMPONENT spray them. 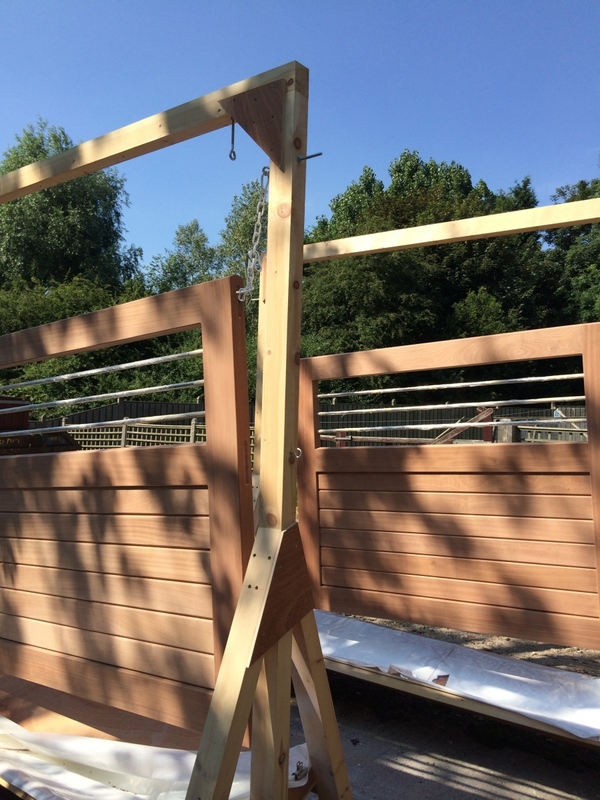 Example is that we hang the frame up separately to the boards, then apply their drench anti-fungal coat then a base primer to all those areas you would never get to when fully assembled.. 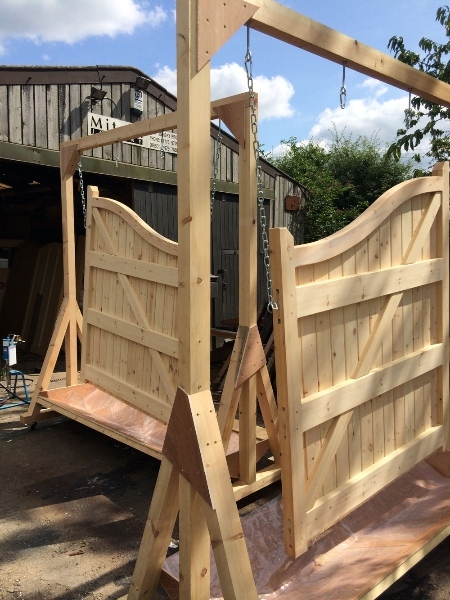 The gates then get finished off to go back into the spray shop for two final coats. Thats five coats in all! and completely sealed off. 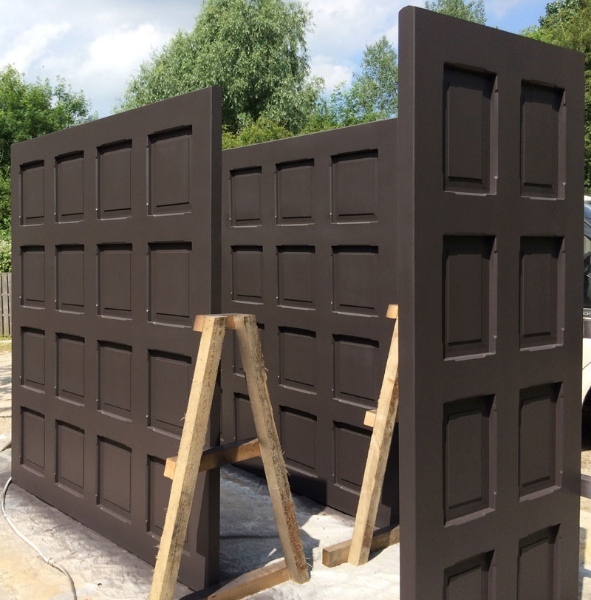 This can be achieved with a painted finish as its an opaque finish where stain is a translucent finish showing any runs or double coating marks making it extremely hard to handle when wet. Filling nails holes before final coat is achievable with paint where doing this mid way through staining is not possible. 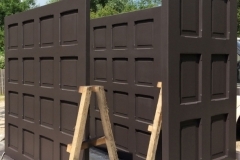 Environmental conditions can dictate the type of finish and approach to Staining or Painting your Gates. The use of a micro-porous stains and paints is essential! This is a breathable finish that allows migration of moisture in and out of the material which regulate the moisture content with its environment. As well as enhancing the natural colours and grain of the wood.The question of why you paint or stain wood often arises by the idealists that just love the look of natural grain in wood. 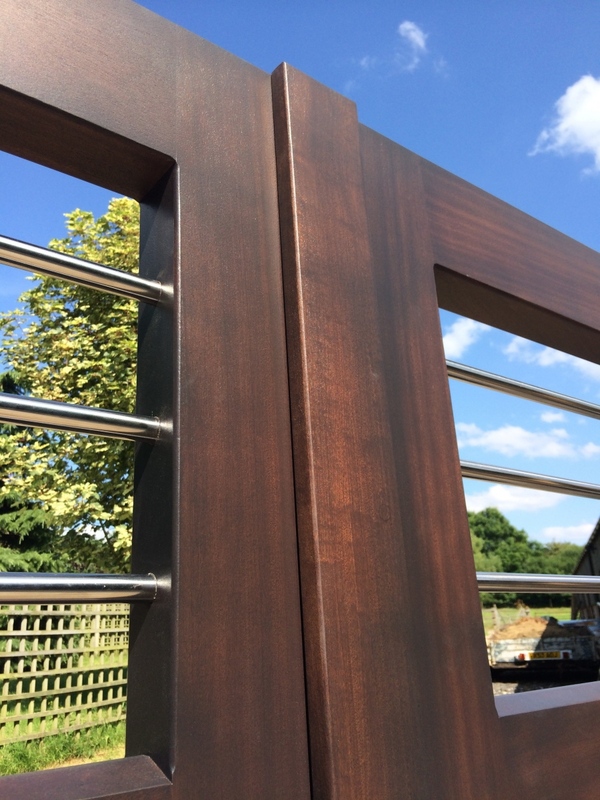 Iroko is a very durable timber to use as the grain sits very well . If left untreated for just teak oiled and left outside, the wood will quickly start to to weather and turn SILVER leading to eventual organic faults (splits checks etc). The draw back to painting or staining hardwood is that it naturally has a large amount of oils and tannin in its cellular make up, which is the reason it performs against rot so well, but it comes at a cost as the very oils and Tannins that help with longevity can argue with the paint or stain in those more awkward places and encourage any finish to prematurely fail. It occurs far more with stain than it does with paints, as paints has a better blocking property. Repairing damage for scratches can be easily achieved with paint. Where stain shows every inconsistency going and has to be very carefully blended in which takes a great deal more time and effort. Gates need to have the correct amount on from the start. 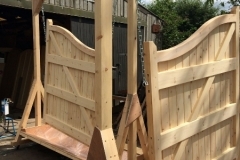 Or you will be forever playing catch up over the early years of the gates life, leading to premature failure of the timber by allowing the weather in. Mitech have a spray shop creating the ideal conditions to apply a factory spray finish that gives a high quality end result. There are a wide range of colours with both paint and stain. Natural warm oaks, red mahoganies or matching in with a RAL colour that your already using . The choice is yours!